In 2345 hectare large SAC/SPA area detrimental factors will be eliminated and sustainable management will be ensured which definitely improve biodiversity. By translocation of the Canal V. from the Pannonic sodic lakebed, 5,9 km former canal section with its 15 km length drainage system (canals and ditches) will be eliminated and filled in. 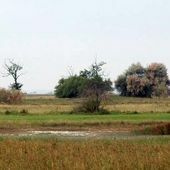 Through the rehabilitation of the natural water balance the open water surface of the periodically flooded Pannonic sodic lake will significantly increase (by 120%) from the presently 180 hectares to 400 hectares, which is also due to the high level grazing for conservation purposes. After the reduction of the vegetation of high biomass production is fulfilled, the grazed area increases with 330 ha and the habitat restoration works can be implemented which will ensure the long-term conservation of endangered 1530 habitats. The infrastructure created and the livestock purchased (300 native cattle, 300 sheep and 50 donkeys) will contribute to the management and long-term conservation of the most valuable micro-habitats by 810 ha within habitat type 1530. On the catchment area 44 hectares of ploughland will be converted into grassland while non-indigenous and invasive plants are eliminated, thus diminish fragmentation, the level of disturbance and contamination caused by intensive agricultural methods. The project’s activities will result the 50% increase of most endangered sub-types of the 1530 priority habitat and also 20% growth of the Annex I nesting bird species related to Pannonic sodic wetland of Böddi-szék will be observable. Results of the project will be disseminated widely in the frame of the media, project branding materials, education, and the impact of the project for the socio-economic development will also be highlighted by a special sustainability study.